I love this recipe because it seems so complicated — between the presence of twee greens and the meticulous plating shown above — but it’s really deceptively simple to prepare and serve. Oh, that and it’s a bright start to a meal. All you have to cook are the beets and the blackberry-red wine reduction (read: simmer three things in a pan for a period of time, strain). And the nutty goat cheese is simply a log of goat cheese rolled in chopped up pistachios and sliced, or sliced and covered with nuts. Easy. Don’t like pistachios or need to avoid nuts? Skip ’em, no big deal. It all has a common theme: a small amount of effort for a big flavor and texture payoff. Now is the perfect time of year to make this dish, both beets and blackberries are quite easy to find at farmer’s markets — but do hurry, their seasons do not overlap for long. A note on quantities: Want a larger salad that serves four or a small salad for six? Choose the larger number listed. A small, starter-size salad for four is achieved with the smaller. The only exception is the pistachios. Use the full two ounces if you wish to slice and coat all sides of the goat cheese with nuts (shown in the second photo above), instead of rolling the entire log in goat cheese (shown in the first photo). Or forget all my over-thinking rambling and just do what you want! Preheat oven to 400°F. Scrub and dry beets very well, trim top and bottom ends (do not peel). If you have some large and some small beets (there always seems to be one huge one in the bunch), cut the larger one(s) so they’re all similarly sized. Coat with olive oil. Cut two (or four) sheets of aluminum foil, wrap each bunch together in their own packet of double-layer tin foil. Place packets on a small rimmed sheet pan (or 8×8″ – 9×13″ glass baking dish), and roast for 1 hour or until beets are tender. Once cooked, unwrap packets and allow to cool. While beets roast, make reduction. In a small saucepan (2 quart), combine wine through orange zest (if using). Place over high heat and bring to a boil. Smoosh berries, reduce heat to low and simmer, stirring occasionally, for about 30 – 45 minutes or until reduced by 3/4. Strain reduction using a fine mesh sieve or jelly strainer bag; set aside. DO AHEAD: Reduction may be made several days in advance, keep refrigerated. Reheat before using for best results. Red: Slice into 1/8″ – 1/4″ thick rounds, cut into quarters, cut into 1/2″ cubes or any combination. Orange or Chioggia: Do not slice, but instead pickle whole to maintain the color once sliced (otherwise they get dyed red from the pickling liquid). Slice as indicated for the red beets once pickled and drained. For pickling liquid, mix together a 1:2 ratio (i.e. 2 tablespoons:4 tablespoons) of red wine vinegar to strained reduction. Mix together vinegar-reduction mixture and beets in a nonreactive bowl or two. Cover and refrigerate for at least 2 hours, stir occasionally if not completely submerged, up to several days. For coated roll: Roll log in chopped pistachios, cut into 4 – 6 slices. Refrigerate until ready to serve. For coated slices: Slice log into 4 – 6 slices, coat all sides with chopped pistachios. Refrigerate until ready to serve. Remove beets from pickling liquid (reserve), pat dry and set aside. For best flavor, bring to room temperature before proceeding. Whisk together 3 tablespoons (1.5 ounces) of the reserved pickling liquid with Dijon mustard. Gradually whisk in olive oil, season to taste with salt and pepper. 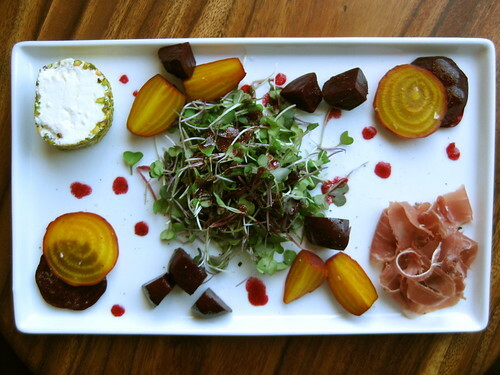 Divide beets, nutty cheese, prosciutto and microgreens amongst 4 – 6 plates. Drizzle vinaigrette over mico greens, dot a few drops on top of the beets and around the plate. Serve immediately. ¹ Preferably smaller beets, no larger than 2″. Any color you like! ² Available at Trader Joe’s, Whole Foods, Costco and most other grocery stores (Trader Joe’s usually has the best price for their private label). May also be labeled chèvre. ³ Whatever brand you like to eat uncooked — I like Cittero (Trader Joe’s, Costco) or the prosciutto crudo (not cotto!) from Boccalone (I think it’s only available at their location in the Ferry Building). ⁴ Available at Whole Foods or Trader Joe’s or grow your own! This looks stunning. 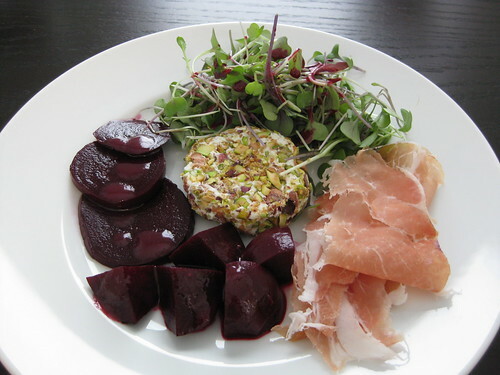 I love how much you’ve got going on on the plate and beetroot are one of my favourite vegetables! Thank you! This is a fun one to make and eat — little bit of this with a little bit of that, never the exact same combination of flavors in a single bite. I may or may not enjoy playing with my food, masking it as something [possibly, it’s a stretch] cerebral.